A flexible, durable Arrow Shape stencil precision laser cut and ready to use. 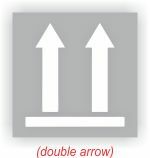 This custom arrow stencil is great for air brushing, spray painting, brushing or rolling. 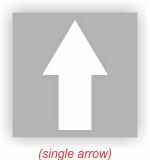 Our laser cut arrow stencil is made from a high-quality polyester film called mylar. This material is popular for stencils because of its pliability and strength. Stencil can be fit to just about any curved or cylinder surface. How long will your custom arrow stencil last? Years if taken care, for dozens if not hundreds of uses.